Ralph Torres, the governor of the US Pacific territory, said President Donald Trump had approved a request for a "major disaster declaration" after the storm. Electricity was out across Saipan, which is home to most of the territory's 55,000 residents. US military aircraft laden with emergency supplies flew in to the Northern Mariana Islands Saturday in the wake of destructive Super Typhoon Yutu which destroyed buildings and cut electricity. Yutu packed winds of up to 180 miles per hour (290 kilometers per hour), left one person dead, and caused widespread damage. At least 130 people required hospital treatment, mainly for cuts caused by flying debris. More than 1,000 were also stranded with the international airport on the main island of Saipan closed to commercial flights to free up space for military aircraft. China's consular office in Los Angeles said around 1,500 Chinese tourists were trapped on Saipan and would be evacuated from Sunday, Beijing's official Xinhua news agency reported. A total of 21 South Korean tourists were airlifted out of Saipan to Guam and returned home Saturday, according to Korean news agency Yonhap. Electricity was out across Saipan, which is home to most of the territory's 55,000 residents, as well as nearby Tinian. Tinian mayor Joey San Nicolas said aid was urgently needed and authorities still did not know the full extent of the damage, two days after Yutu swept through. "Many homes have been destroyed. Our physical infrastructure has been compromised. We have no power or water," he said. "Our ports are currently inaccessible, and several other points in other parts of the island are also inaccessible." There have been reports of looting, and stores which were able to open quickly ran out of water and food. 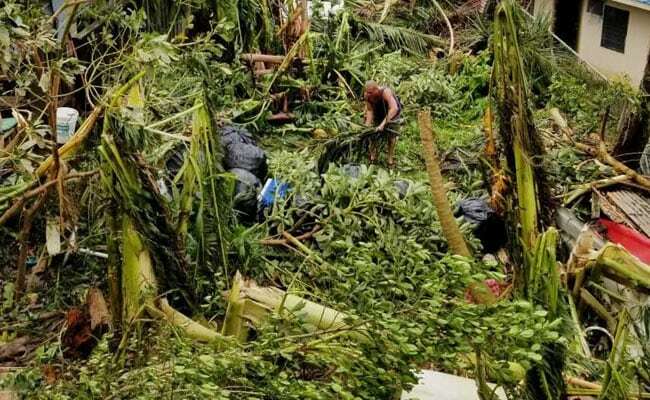 "Right now, water, clothing, personal hygiene and easy to cook food items like canned goods and instant noodles are needed," Saipan resident Jonathan Perez told AFP. Torres' office said on its Facebook page that the one known fatality was a 44-year-old woman who died while taking shelter in an abandoned building that collapsed.